Starna Scientific offers the world's widest range of reference materials for qualifying the photometric accuracy and linearity of UV spectrophotometers, covering all wavelengths from the far UV to the visible. Some, such as the new Deep UV references, are unique to Starna. 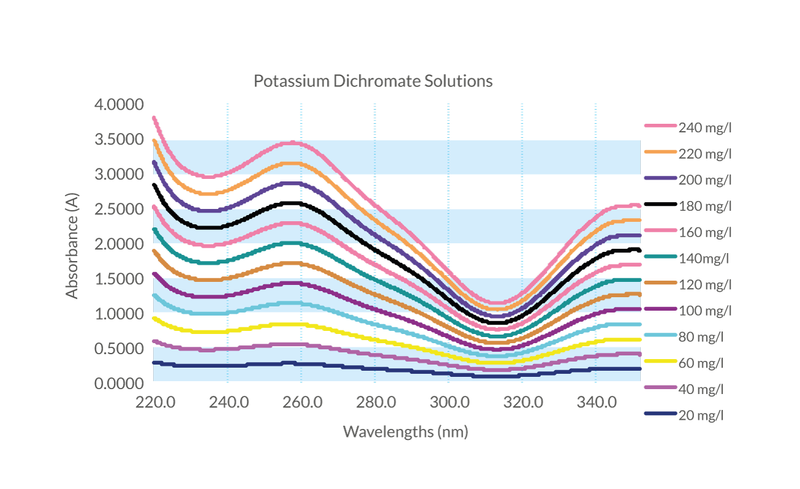 A range of 12 solutions covers absorbance values from 0.2 A to 3.6 A at wavelengths from 235 nm to 350 nm. An additional reference is available calibrated at 430 nm (absorbance 0.95 A). These references are available singly or in any combination and as convenient sets, each of five references and a blank solution, covering low (up to 1.5 A) and high (up to 3.0 A) absorbance ranges. They are also used in Starna’s UV Instrument Qualification Kits, which contain all you need to comply with Pharmacopoeia requirements. These references consists of Potassium Dichromate solvated in 0.001 M perchloric acid and permanently sealed by heat fusion into 10 mm UV-quality quartz cells, and a blank cell containing 0.001 M perchloric acid. This solution gives a spectral scan containing characteristic peaks at 257 nm and 350 nm, and troughs at 235 nm and 313 nm. 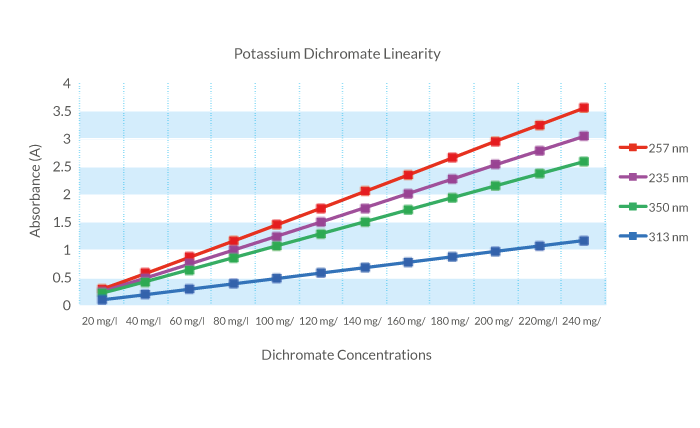 Within the concentration range 0 - 240 mg/l, if the absorbance scale of the spectrophotometer is linear, the measured absorbances of a series of potassium dichromate concentrations will be a linear function of concentration. 12 solutions are available covering this concentration range in 20 mg/l steps. A 600 mg/l solution is also available, certified at 430 nm for use in the visible region .